Lets continue exploring more about Class based exceptions by checking out the runtime flow when an exception is being raised. To understand it better we’ll use the demo example of Class-based Exceptions I – Basics. I have given the related code snippets here. It would be useful to compare both of the code snippets to understand, how system is behaving. If raised exception is not being propagated in the call stack for (CX_STATIC_CHECK & CX_DYNAMIC_CHECK exceptions) till a TRY..ENDTRY block, it would result into Runtime error. Like in Demo, if the LCX_MANDATORY_MISSING was not specified in the method CALCULATE, it would result in run-time error. In case of exception, system would try to find corresponding TRY .. ENDTRY block in the call hierarchy. If it doesn’t find any, it would result in Short-dump. Like in the demo, if the method CALCULATE would be called directly without TRY..ENDTRY it would result in short dump. lo_obj->calculate( iv_num1 = 10 ). *      WRITE: /  'Mandatory Parameter is missing'. *    CATCH CX_ROOT INTO lo_exc_root. *      lv_msg = lo_exc_root->get_text( ). If a TRY..ENDTRY block with specific exception being caught using CATCH excpetion_id, system would be successfully able to handle the exception. Whenever INTO addition is specified, instance of an exception object would be generated. In demo application, exception LCX_MANDATORY_MISSING is an example. WRITE: /  'Mandatory Parameter is missing'. 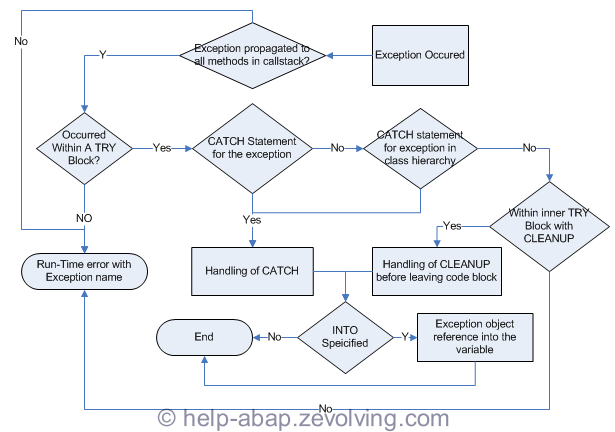 If a TRY..ENDTRY block with generic exception being caught using CATCH exception_id, exception would be handled successfully. In demo, exception CX_ROOT is handled this way. This code lines will raise CX_SY_ZERO_DIVIDE, but CX_ROOT is being handled. lo_obj->calculate( iv_num1 = 10 iv_num2 = 0 ). If a CLENUP block is specified, within an inner block of TRY…ENDTRY, it would gets executed, before sending control back to the caller. More on CLEANUP in coming post.